Now that the fall is here and the weather is changing, it’s getting more and more cold outside. This is the perfect time to retire summer wardrobe and look for warm winter garments. I suggest to take scarves to look chic while staying warm. Of course, they come in different shapes and patterns, but Pavlovo Posad Shawls stand out against others. 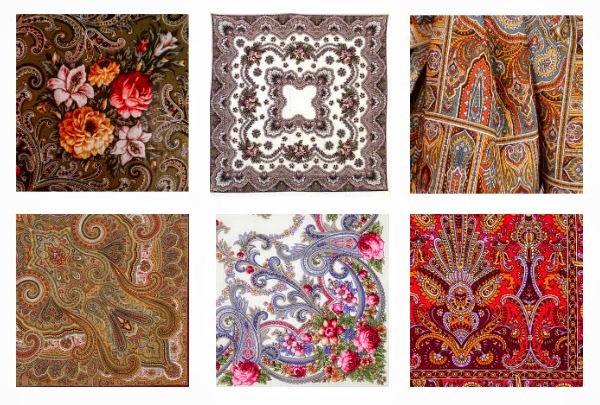 These folk “Matrioshka” shawls are well known for its sophisticated beauty. They are made from 100% natural wool in the ancient Russian town Pavlovo Posad. Textile factory of that city produced woolen shawls since 18th century. Women wore them around the shoulders and as a headwear then. I would say it was a part of traditional costume. Nowadays, the scarf with bright color pattern is a great addition to the everyday outfit. Indeed, this accessory looks both great with elegant dress and casual jeans. It can be tied around the neck to feel warm and beautiful at the same time. Adding Russian Shawls can be the easiest way how to look chic during the cold season. Besides, designs are divided into different pattern and color designs, which means they come from different Russia regions. It gives us even more variety and choice in picking up the most suitable print to match the outfit. Pavlovo Posad scarfs are made of high quality fabrics. Because of their delicate work, these shawls work as a real statement for any occasion. Just check how beautiful they were styled in the fall collection by Lena Hoschek! Костюмы/рубашки Brioni и Canali; total-look Ermenegildo Zegna и Baldessarini; трикотаж Giorgio Armani. Работала с этими брендами и видела, как потрясающе сидит эта одежда, и насколько она преображает мужчин. Качество безупречное. Да и кампании они делают весьма хорошие, приятно смотреть! kak tq otnosishsja k takomu modnomu domu Stephane Rolland?